This Adrenal Reset Diet approved recipe is a quick and delicious week night meal. Impress your guests and bring this to your next holiday party. 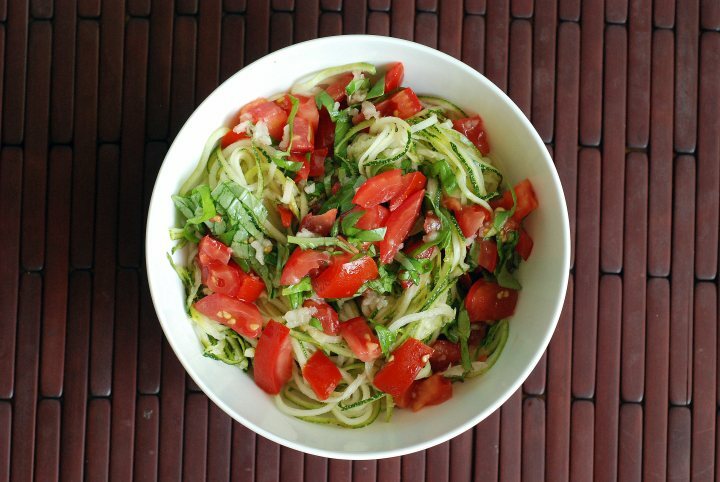 Use a spiral cutter to make zucchini noodles. Cover and refrigerate until ready to use. Mix the bruschetta ingredients together and let them marinate in the refrigerator for at least 15 minutes. Shake the container every few minutes to meld the flavors together. Heat the zucchini noodles on medium-high heat for 5 minutes in a sauté pan. Top with the cold, fresh bruschetta. Serve immediately. For a full meal, add a lean protein like grilled chicken.